Synth-ing: GONE BUT NOT FORGOTTEN - Korg Zero 8! 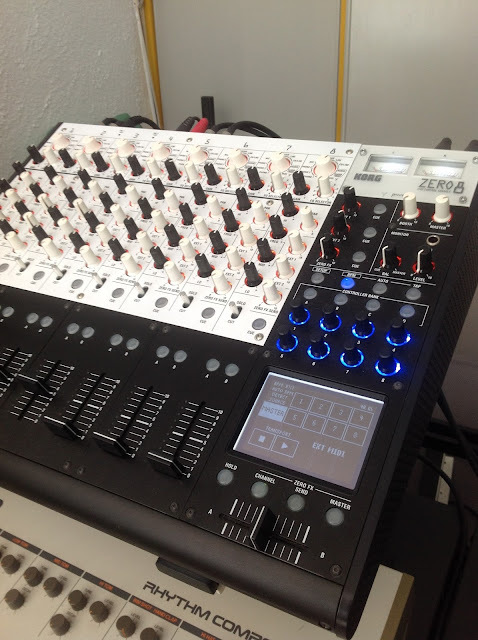 If you followed my performances at electro-music.com, you probably remember how important this mixer was in my setup! Despite it wasn't my first mixer (that honour falls on a Peavey mixer I got but ended up never using because was too big to fit the space I had available...), it was the first mixer I used and it definitely taught me a lot! With it, I understood how important processing can be, and how nicely it can enhance the overall sound of your performance! It featured a nice amount of EQs and effects, as well as two sets of stereo send / returns that I could use with chains of external hardware processors! But it also allowed me to expand the number of stereo effects I could use at once from 5 (using my Edirol FA-101 sound card) to 8, at a time in which most of my gear featured stereo outputs! However, my setup has changed a lot since then, and right now, I have lots of gear with mono outputs. But what made me start considering selling it was the acquisition of my RME Fireface 800 sound card, which I felt offered nicer audio quality than the Korg Zero 8 (which has some digital hiss...). And of course, in the meanwhile I came up with a different solution for recording in the studio, which consisted in a mixer with individual outputs per channels, to give me pre-amps and EQs, which would then be processed by my Symbolic Sounds Kyma Capybara 320 and then send to the RME Fireface 800! Being quite honest about it, I felt that Korg came up with a great concept with these mixers! If you want to do a live performance using stereo gear, I don't think there is any better mixer out there for that task! Having a built-in KaossPad is a truly amazing feature for a performance mixer! And having it backed by so many different EQ types and actually 3 different effects processors available at once, with two more effect chains being available thanks to the two stereo send / returns, makes it a true performers dream machine! And if you search online, this is the main complaint you'll read about this mixer, along with the digital hiss you can hear (not such a big problem if you are playing live use speakers, but a real problem when using headphones or recording with it...). Back when I got it, I was aware of that, but since nothing gave me the same amount of nice features it did for the same price, I decided to give it a try, since it was an ex-demo product covered by warranty. In the end, reliability ended up being really bad, but I don't regret getting it as I feel it really thought me a lot! But if you want a mixer for live performances and you use mostly equipment with stereo outputs, I would definitely recommend you to check it! Of course, if Korg would come up with a new version that fixes those problems, and improves in audio quality, it would be a whole different story! Despite all the headaches I might have had with it, it will always have a special place in my heart as it was my first proper mixer and the one I used in most of my performances (it was replaced sometimes by the Yamaha MV1602 that I has been sold as well, and other times by the Clavia Nord Modulars). So, if a new improved version would come up, I could definitely consider it!